Pecan wood has many uses, ranging from furniture to flooring. flooring. It can even be used for cooking. Pecan is a hardwood and is a cousin in the hickory family. In other words pecan wood is a type of hickory wood. 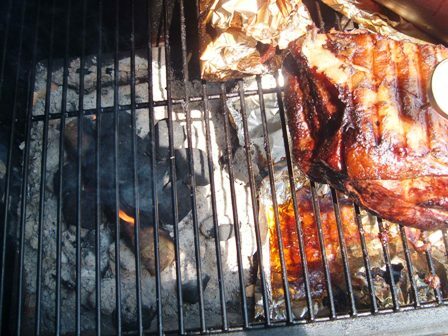 The only dealings that I have had with pecan wood are using it to smoke meat. A while back I cut up some branches from a pecan tree in my yard that fell during an ice storm. 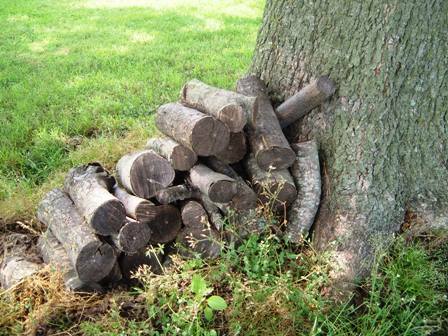 I stacked the wood in a small pile near the tree. It dried nicely. Later I used it in my grill/smoker while cooking pork and bologna. It worked well, provided a good heat and smoke source. The meat tasted great. Pecan shells can also produce the same effect. Use with care though, I've heard that too many cause somewhat of a bitter taste. Being a hardwood, pecan wood is a sought after wood for flooring and furniture. It has a close grain and a color that is brown to pale red, with darker streaks-might be described as caramel colored. At many lumber yards pecan and hickory wood are not really distinguished. They may just be sold together. If they are sold separately hickory may be called "true hickory" while pecan might be called "pecan hickory." Of note, since this wood is very hard, it doesn't take kindly to the use of nails. Try using screws in it when you can. It is very durable and strong, which is why it is often a flooring choice. Another reason is that it stains well when finishing. If you are looking for a classic hardwood for flooring, furniture, or any other woodworking project that requires a tough and durable wood, pecan would be a good choice.